The Touchdown Club of Atlanta was founded in 1938 by a group of football fans who were looking to promote the game of football in Atlanta. This group would get together each Monday in the fall of 1938 and talk about the games that occurred over the weekend. Keep in mind; this was a time before ESPN, before social media – and before face-masks. The great sports writers of the Atlanta Constitution were the source of information on games unless you were able to make it to a game on a Thursday, Friday, or on Saturday. It was at one of these meetings on November 6th, 1939 that the group decided to award an outstanding football player in the Southeast after the close of the season. This of course meant the Southeastern Conference. Thus began the tradition of awarding outstanding collegiate athletes. In the fall of 1943, and in the throes of World War II, the club decided to also award an outstanding prep player to be honored alongside the outstanding collegiate winner at a year end ‘star studded gala’. Here began the Touchdown Club’s history of honoring a prep ‘Player of the Year’. This is where the story and our history begin. For a frame of reference, in the 1920’s, 1930’s & 1940’s high school football in Atlanta was dominated by the Boys High Purple Hurricanes and to a lesser extent the Tech High Smithies. The games were usually played at Ponce de Leon Park, briefly known as Spiller Field, in front of large crowds with a maximum capacity of 20,000 Atlantans. Ponce was home to The Atlanta Crackers, the Atlanta Black Crackers, and occasionally played host to visiting college teams. The Tech-Boys matchups would regularly fill the stadium to capacity and out draw the professional teams and become the biggest annual sporting event in Atlanta. Gene Chandler was a Tech High Smithy junior lineman in 1942. He was in just his first year of playing football and the Smithies were not having a good year. In fact, they had not been having any good years since long time coach Gabe Tolbert left the program in 1939. Nonetheless, in 1942 the Smithies got an invite to play in the second annual Kiwanis Club Milk Bowl Game. Tech High would be playing Boys High in a rematch of a lopsided loss earlier in the season by the score of 28-14. Going into the game the Smithies were underdogs and given little to no chance. This game for Tech High was important to the players and to the school. The Smithies vowed to win the game for a former teammate, Billy Jones, who was killed in the service of his country December 2, 1942. The game was played on December 12th just 10 days later. The team was emotionally charged, as was Billy’s brother Johnny, who would play ‘“60 brilliant minutes” along with the rest of the Smithies on the way to a 15-7 improbable victory. The game was described as a “Hard hitting affair” and perhaps the best description – or myth – to come out of the game was a hit by the Touchdown Club’s eventual first Player of the Year, Gene Chandler. As described by the Atlanta Constitution, “One rabid fan, Floyd Garrett…asserted the Gene tackled Griffith so hard that he split his pants all the way up the back and dislocated his knee”. No one checked the authenticity of this anecdote as it was deemed worthy enough to stand. Gene Chandler was described as a “rangy, blond Hercules”. The 6’2” 195 pound lineman, who played center and linebacker, was far from a great player in his first game of his junior season. By the end of his junior season, he would become a dominant force. 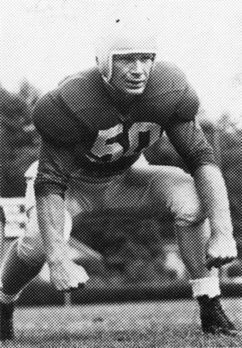 By the time his senior year was completed in 1943 he was considered, “The most devastating defensive player observed in Georgia High School circles in many seasons”. His linebacker play was described as, “deadly & savage”. Chandler would lead a Tech High defense that would post 7 shutouts and limit opponents to just 2.8 points per game. He would also anchor an offensive line that would pave the way for 29 points per game. The team would finish the year at 10-2 and would win the Smithies second straight and the 3rd annual Milk Bowl 7-6 against an all-star team comprised of the best players from around Atlanta. He was voted the best player in Atlanta by the newspapermen of the day and given the Player of the Year award in front of the Touchdown Club and 100 distinguished guests at the end of the year gala. Chandler would go on the play at the University of Georgia under coach Wally Butts – but not before fulfilling a two year Naval commitment during World War II. By the time he would eventually arrive at UGA in 1946 and according to an article, coach Butts told his team, “You better not be standing around when Gene Chandler is on the field. He will make you wish you played your football somewhere else”. Gene would earn varsity letters in 1947, 1948, and 1949. He and his Bulldogs would play in the Sugar, Gator, and Orange Bowls while he was a starting defensive end. He would be named UGA’s most valuable lineman in 1949. Gene would lead a full life in Decatur Georgia. He passed away in 2006 at the age of 80. Former Touchdown Club President and great Georgian, D.L. Clayborn said, “Gene Chandler was the best high school lineman probably that ever lived”. The great Gene Asher, who covered prep sports for the Atlanta Journal, said about Gene, “I have been watching football for 60 years, and without a doubt he was the finest high school lineman I ever saw”. It is here he will be forever remembered as the Touchdown Club of Atlanta’s first Player of the Year – and as a lineman to boot. Simply amazing. *Many thanks to the ghsfha.org for all that they do. Thank you to the great sportswriters of the Atlanta Journal from 1941-1943. Lastly, to Gene Asher, whose book,” Legends”, is a great resource for the state of Georgia and for his work at Georgia Trend Magazine.